I joined the team here at Align 4 Life in October 2017. I had received chiropractic care previously when I had a back issue. But the care I was given for completely different from the care I have now received and seen here. 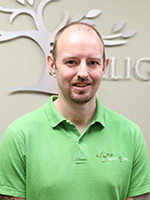 Before my treatment at Align 4 Life I had always thought that chiropractic was for the treatment of injuries and posture problems. I now understand that have a healthy mind and nervous system are the primary essentials for long term healthy living. I have always been a keen sportsman playing hockey, long distance walking, marathon running and working out at the gym. With this interest, many years ago I started looking into the theory of exercise and sports movement. From there I enrolled at the Isle of Man college and studied Human Biology, Psychology and English. To further my interest, I then studied for my gym instructor and personal training certification and level 4 nutrition diploma. This lead me into working at a local gym for 7 years doing classes, personal training and rehabilitation for issues including hips, knees and backs. Spending time doing rehabilitation with clients gave me a lot of pleasure when seeing client being able to move better and without pain. This has naturally led me to working with Neil and the team at Align 4 Life. Already I enjoy the relaxed atmosphere interacting with the great clients and fellow staff members.